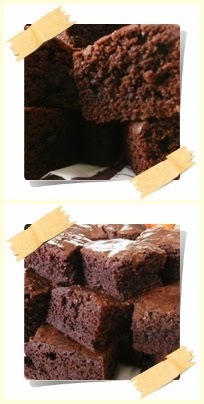 On Friday I bake brownies cause a friend is coming and wants to have a good time with her. So, since I have not bake anything for quiet some time I think I make something easy first. Also cause the ingredients that I have at home allow me to make this cake. Some friends ask for the recipe when I put up the picture on fb. I used to have the book from NCC (Natural Cooking Club) with this recipe in it, but since I lent it out to a friend and have not got it back, I go their (NCC) page to get the recipe. But I will write it here for everyone who wants to try it. - Cover a baking sheet with parchment paper and butter/oil. Preheat oven to 180 degrees Celsius. - Mix the cocoa powder, flour and vanilla powder. - Beat eggs and sugar until the sugar granules become more refined (don't over beat or you won't get the fudgy texture) . Add salt, beat again until blended. - Turn off the mixer, sift flour mixture into the egg mixture and stir well. Pour cooking oil, stir well. - Enter the walnuts and chocolate chips and stir. - Pour batter into pan, bake approximately 35 minutes. Test with a toothpick / stick clean. - Refrigerate before removed from the pan and cut into pieces.